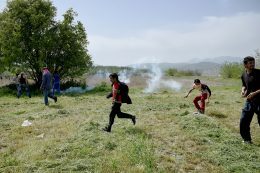 Giannis Papanikos/Shutterstock Many immigrants have been forced to run to avoid tear gas canisters thrown by authorities. By now, you’ve likely seen the viral photograph of a Honduran mother and her two children fleeing from tear gas in Tijuana, Mexico. Unsurprisingly, the image has been a polarizing force: Many on the right praised U.S. border agents for “protecting” the southern border — conservative commentator Tomi Lahren called it “the highlight of [her] Thanksgiving weekend” — while the majority of liberals condemned the actions of the border agents, pointing out the irony of attacking fleeing migrants on Thanksgiving weekend. While each side has contrasting views, both of their respective rhetoric on immigration is lacking. To backtrack, the people of the so-called “migrant caravan” are Central American asylum-seekers fleeing their countries mostly due to violence. In particular, Central America’s Northern Triangle — Honduras, El Salvador and Guatemala — is known for high rates of homicide, extortion and corruption, drug trafficking and gang violence. Its countries are consistently ranked among the most violent countries in the world. These factors are certainly cause to flee. No meaningful conversation can be had about Central American refugees without addressing the United States’ contribution to the destabilization of their countries. For instance, the CIA aided a military coup in Guatemala to overthrow its democratically elected government in 1954. Why? Guatemala’s government had decided to tackle exploitative labor practices and give land to Mayan Indians, and that would have clashed with U.S. interests, specifically threatening the U.S.-owned United Fruit Company and all the land it controlled in Guatemala. Moreover, the leftist leadership in Guatemala was attacked with accusations of communism, justifying U.S. intervention under the guise of “spreading democracy.” In short, the United States overthrew the Guatemalan government to continue profiting off exploitative Guatemalan labor and resources through the United Fruit Company. The U.S.-backed military regime in Guatemala then led to a series of conservative military dictators and, eventually, the Guatemalan Civil War, which lasted for 36 years and saw the Guatemalan government execute thousands of people, especially its indigenous populations. I draw out this historical example because it must be made clear that much of the violence these refugees are fleeing from was either caused or supported by the United States. I have yet to see people on either side of the political aisle substantially address this. Additionally, both sides focus solely on the legality of the migrants’ actions. For the right, these people are breaking the law by not coming “the legal way,” and so that justifies any actions the United States takes against them. Liberals reply, correctly, that asylum-seekers actually have to come to the United States first in order to seek asylum. In fact, U.S. Citizenship and Immigration Services states that “[y]ou may apply for asylum status regardless of how you arrived in the United States or your current immigration status.” This answers the right’s assertion about the illegality of the migrants’ actions, and all the right’s allegations that “illegals” increase violent crime in the United States and abuse our social benefit programs have been disproven time and time again. Though liberals are correct about the asylum process, the conversation cannot end there. We must acknowledge that our laws often directly oppose social progress. During segregation, people like Rosa Parks were breaking the law. During the Holocaust, anyone who aided in the Jewish people’s escape was breaking the law. Yet, in retrospect, we know that these lawbreakers were integral in saving lives and pushing humanity in the right direction. Therefore, I find it unproductive to dwell on the legality of the situation at the southern border. It should be enough that the refugees are people, and they need help. In the same vein, I’ve seen my fair share of liberals proclaiming that we should allow the refugees to seek asylum simply because of what they can do for us. In 2015, Kelly Osbourne of “The View” said that if there are no Latinos in the United States — referring to immigrants in this context — then, “Who is going to be cleaning your toilet, Donald Trump?” Likewise, I’ve seen tweets from liberals where they reduce the value of immigrants to their labor, often mirroring Osbourne by alleging that we need janitors, maids and other jobs that are considered low-skill — we should think about the stereotypes here, too — and that’s a reason to grant migrants asylum. This is not a progressive stance. Again, we should help asylum-seekers simply because they are people who need help. We need to work on our rhetoric in regard to immigrants. The whole spectacle we are making of the migrant caravan is doing just that — making it into a spectacle. That’s damaging to us because it removes the individual humanity of each person looking to seek asylum and reduces them to a political hot topic, something to post on social media about and attain “woke” points. I implore you not to fall into that. Advocate for these people not because of what they can do for us, but because it’s the right thing to do. Sarah Molano is a senior double-majoring in English and philosophy, politics and law.